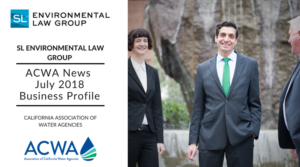 The California Association of Water Agencies (ACWA) highlighted SL Environmental Law Groups talents in the July 2018 ACWA News. ACWA is the largest statewide coalition of public water agencies in the United States. The 430 public agency members the are collectively responsible for 90% of the water delivered to cities, farms and businesses in California. The ACWA mission has always been clear: to help members promote the development, management and use of good quality water at the lowest practical cost and in an environmentally responsible manner. SL Environmental Law Group helps state, cities and water utilities who find themselves impacted by man-made contamination. Our objective is for the polluters, rather than ratepayers, to pay for the costs of treating water to meet regulatory standards.